Last Sunday, Oct. 7, parishioners from across the Philadelphia Archdiocese and Catholic across Pennsylvania and the Northeast met to celebrate a Mass for the cause of canonization for Blessed John of Vercelli, founder of the Holy Name Society. 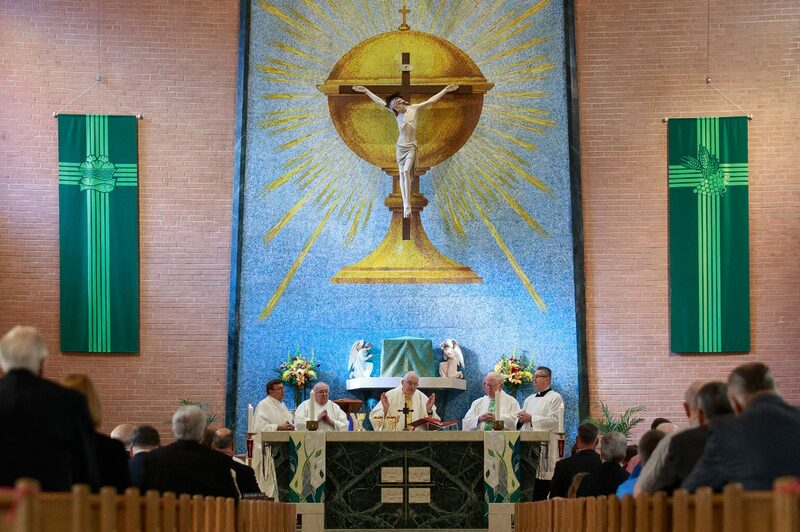 The Mass also served to honor several long-serving members of the society and their tireless work to support the sanctity of the Holy Name of Jesus Christ. Bishop Joseph F. Martino celebrated the afternoon Mass at Our Lady Help of Christians Church in Abington. At the end of the Mass, Father Anthony Janton, archdiocesan chaplain of the Holy Name Society for the past four years, honored several long-standing members of the society, some of which have been members for over 40 years. Father Janton, himself a member since his youth, started a chapter of the Holy Name Society at Our Lady Help of Christians when he became pastor 15 years ago and has been one of the society’s most ardent supporters. David Reichert from Holy Savior Parish in Norristown is president of the Holy Name Society in the Archdiocese of Philadelphia. Working under the direction of their pastor, each of the 15 active Holy Name Society groups support the critical needs of their individual parish. Projects range from decorating the church for Christmas to engaging in the corporal works of mercy, such as visiting prisoners, working at parish food banks and supporting religious sisters and brothers. The society at Our Lady Help of Christians is very active in supporting Catholic education at the local schools, Queen of Angels and Regina Coeli. Another main focus of the Holy Name Society, and the cause for which this Mass was celebrated, is the canonization of Blessed John of Vercelli. He lived in northern Italy during the 13th century and rose to be master general of the Dominican Order from 1264 to 1283. Respected for his devotion to the faith and fervent defense of the Holy Name, John was called upon by Pope Gregory X to conduct a mission across Europe. At the time, the pope was concerned about grave disrespect being shown to the Name of Jesus in the form of blasphemy and vulgarity. John was tasked with rooting out such inappropriate speech and assuring that the Holy Name was given its due respect. Over his lifetime, John was engaged in a number of spiritual and political disputes, often consulting with his contemporary, Thomas Aquinas. John is known to have aided in constructing the framework for the Second Council of Lyons as well as easing the tensions between the Holy See and King Philip III of France. The Holy Name Society carries on the mission of Blessed John through the pledge to ever venerate the Holy Name of Jesus; reject perjury, blasphemy, profanity and obscene speech; and honor the Vicar of Christ as well as the lawful authority of both civil and religious organizations. Each society member carries this pledge in his hearts, calling on it as a reminder to live these precepts every day of his life. The Mass on Sunday ended with a recitation of the pledge as well as the veneration of a second-class relic of Blessed John. The relic is a two-inch piece of wood off the back of Blessed John’s walking stick, which dates back to around the year 1275. 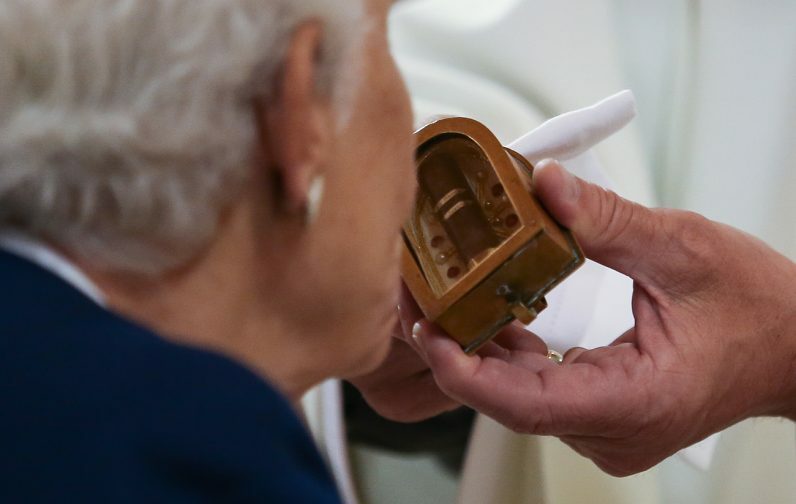 The relic is currently housed at Our Lady Help of Christians, with the goal of having the relic permanently displayed in the church. Those interested in joining one of the Holy Name Society groups in the archdiocese can find their local group on the society web page. Any parish wishing to start a Holy Name Society group of their own should contact David Reichert at david.e.reichert@comcast.net.